Swaggering Capitano is one of the newest masks in the collection of Commedia dell’Arte masks. This mask is a great modern interpretation of the archetype of Capitano. 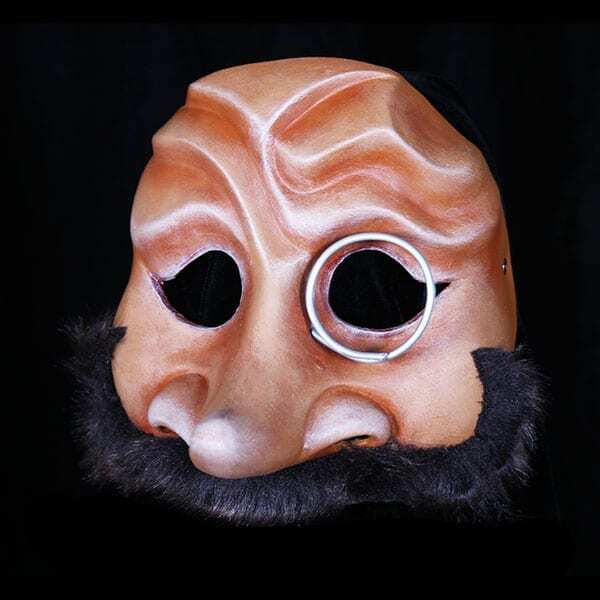 This mask has the tradition mustache worn by many a capitano though out the history of theatre style. The mustache and the more contemporary mask design allow history and modern practice to meet in this expressive form. Every country of the world is still full of swaggering captains. They strut from Italy, Spain, France, Russia, England, the United States and beyond. Each wears a fabulous uniform decorated with the awards of waring and winning against a sworn enemy. Capitano is not only a slayer of soldiers but hearts or at least he is sure that he is the man for all. Capitano is a man of all ages. He was certainly more revered in the age of sword play but now he can show his pumped biceps and pretty abs while brandishing a fancy firearm just as he did with his sword in days gone by. Capitano is the the true flamboyant officer of the theatre masks.